In times of disaster and crisis it is often difficult to get through to other people over the phone whether it is a land line based system or a cellular phone. However, the one thing that does work is sending SMS based texted messages. This is due to the way SMS messages work, the important thing to know is that they require less bandwidth to send the messages over the network, and once you hit send your mobile device will keep trying to send the message until it is sent if the network is busy. All this increases the chances that your message will be sent to its destination. Though I wont get into the super techincal of how SMS messaages work or the different protocols and spectrums involved, the important part is that you know that your message will get through and you have other options if you can't place a call. If you have any doubt the use of SMS messaging goes back to September 11th when people used it to send messages to loved ones. I also personally used SMS messaging duing 9/11 when I could not get through on the phone. 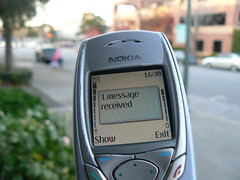 Though other examples may exist before then, this was the first major event to show that SMS text messages are a reliable way of getting your communications through after a disaster. Since then, other examples include Katrina, the Mumbai terror attacks, and the earthquake in Hatti as well as others.